If you love sweets (and who doesn’t), you’re going to want to stop by our new candy store, The Candy Cabin, during your next visit. The new store is located in the space previously occupied by the Goody Gum Drop and features all sorts of heavenly hand-dipped delights. 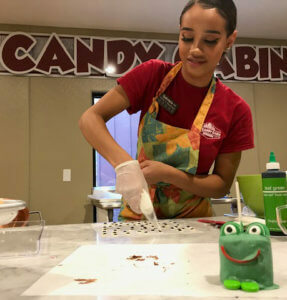 Stop by and see our candy makers in action whipping up some of your favorite treats. You’ll definitely want to try out our homemade Turtles and Sea Salt Caramels – they are out of this world! We also have some fun candies like Frogs, Bears and Moose that are made just for kids – and they love them! And don’t miss our freezer section with frozen bananas, cheesecake and Twinkies that are covered in our rich creamy chocolate! Chocolate Covered Bacon, Almond Joys, Dark Chocolate Almond Bark, White Chocolate Almond Bark, Cashew Clusters, Peanut Clusters, Dark Chocolate Chunks, Coconut Haystacks, S’mores, Toffee, Almond Toffee, Puppy Chow, Peanut Butter Cups, Chocolate-Covered Gummi Bears, Dark Chocolate Sea Salt Caramels, Dark Chocolate Caramels, Milk Chocolate Caramels, Milk Chocolate Sea Salt Caramels Cashew Turtles, Pecan Turtles, Dark Chocolate Pecan Turtles, Rice Krispie Treats, Mint Meltaways, Frog Oreos, Moose Suckers, Chocolate Suckers, Mint Chocolate Covered Oreos, Chocolate Covered Peanut Butter Sandwiches, Peanut Butter Meltaways, Milk Chocolate Boardwalk Crunch, Dark Chocolate Boardwalk Crunch, Milk Chocolate Chunks, White Chocolate Chunks, Dark Chocolate Mousse, Coconut Bon Bons, English Toffee, Lemon Peels, Dark Chocolate Maple Creams, Nonpareils, Orange Creams, Milk Chocolate Orange Peels, Dark Chocolate Orange Peels, Milk Chocolate Sponge Candy, Dark Chocolate Sponge Candy, Strawberry Creams and Mint Meltaways. And remember: Calories don’t count on vacation! Check out our store hours in the Wilderness Express. Hope to see you soon!